Let me tell you about my recent craft show fail. I really need to vent, and you’re the lucky audience. Thanks, I appreciate it. About three years ago, when I thought I was a runner, my sister Jimmie and I signed up for a race on a November Saturday morning. In The Big City, at a high school, they host this race annually as a fund-raiser. Jimmie ran a 10k that day, and I ran the 5k, while Coach and the girls did a one-mile fun run. It wasn’t long after that when I realized that I am not, in fact, a runner. Not at all. Not in the least. The only fun thing about any of the races I ran was the finish line, and maybe the large Iced Mocha that I allowed myself after each one (I only did 4). Anyway, back to the point. The high school that hosted that race was all abuzz with activity on that cold, fall morning. People were rolling cart after cart of the neatest-looking stuff into the building, cars were everywhere, and I became extremely curious! I asked Jimmie if she knew what all the commotion was, but she had no idea. I finally asked enough people until someone informed me that it was an arts and crafts show. The high school hosted it annually to raise money for their orchestra. Don’t you know Coach was just thrilled when my eyes lit up, my jaw dropped, and I said, “We have to go!” He knows this look, and he knows it is a force to be reckoned with. So, go we did. Whether Coach hated it or tolerated it I will never know, because I was in heaven the minute we stepped through those doors. The entire (huge!) 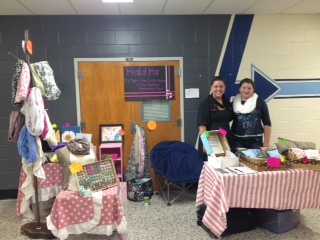 school was filled with booth after booth of handmade goods, up and down every hallway and the entire cafeteria. We walked, and walked, and walked…at least another 5k…and we shopped. I got lots of great gifts for Christmas, and also got a ton of great ideas for projects of my own. I’m kind of a craft show snob. Which is really silly, because I’ve only been a vendor at three of them, and only once was I selling things I made myself. I just can’t help it; I walk through and enjoy either being amazed by someone’s talents or I’m thinking, ‘I could make that so much cuter, add this, take away that, and really make it something…’. I know that’s no way to be, but my creative process works that way, and I can’t help it. So I was like a sponge that day, soaking up ideas for things to make or paint or draw or sew. I just never forgot it. Therefore, when I got the light bulb idea of signing up as a vendor at a craft show, this high school in The Big City came to mind. I signed up right away, and was actually a couple days past the deadline, but they took me anyway…..maybe the light bulb should have gone on then, but it didn’t. I paid my $50 vendor fee and put my nose to the grindstone for a solid month, working on my wares every spare minute of the day. I lost sleep, dealt with an aching back, worried, and tired myself out to the point of utter exhaustion. Would I have enough stuff? Would I be able to set up a cute enough booth? Jimmie was a life-saver, agreeing to make me a sign and get me some business cards, and I can’t even begin to tell you how much Coach, Pooh and Tigger helped with this. All of my friends and family were supportive and encouraging, and I was just working like a cranberry peddler into the wee hours of every night. I set up a mock-booth in my garage on the Tuesday before, and felt pretty good about my inventory, after spending some time perusing craft fair set up ideas on Pinterest (I also came up with some great ideas all on my own, which I shared before in my post Craft Fair Set Up Ideas | Craft Show Crunch. I know…sad that I put in all that work only to have a craft show fail). I still had several scarves to finish before the big day, but I managed to get the last of them squeezed in by 8:30 Friday night. Pooh really took the most interest in the whole thing, and she worked along with me every chance she got. She doesn’t use a sewing machine yet, but the girl can Mod Podge like nobody’s business. She and Tigger helped a lot with my magnets, and Coach cut more fabric than he ever thought possible (you may remember I was suffering from some kind of weird hand pain during this of all times). But Pooh decided early on that she wanted to go with me to the show and help run the booth. She was more excited than I was, and that was a huge motivator for me. Of course, we all want to succeed in front of our children, those beings who were put on this earth for us to set examples for. The Saturday finally came, and Pooh and I hit the road at 6:00 am, the MinivanWithAPlan loaded down to full capacity with tables, shelves, scarves, Feel Better Bags, and nerves. My Duck Tape torso was securely strapped in, as well. We made great time, got there by 7:15, and signed in at the door. One of the members of the student orchestra grabbed a cart and helped us unload, and we started toward my booth. And, we walked. We walked, and walked, and walked some more, until we were in the stinky, 90 degree belly of the school. We turned so many corners, I feared I would never find my van again. It’s no secret that setting up craft show displays is a lot of work, but the distance we had to travel to get to my spot made this one really exhausting! We set everything up, and we finished just in time for the 9:00 opening. Jimmie joined us and helped us get it all perfect, and brought my sign. It was absolutely darling, y’all! I couldn’t have asked for a better sign, except she might-have-sorta-kinda-gotten-the-title-wrong. Otherwise, it was perfect! And my business cards? I love them. They are exactly what I needed! Several racers came through, still wearing their numbers. I sold a few scarves! I sold an eye mask! By 11:30, I had made my vendor fee! I was pumped! My mind filled with thoughts of a big Christmas, my heart filled with hope…. Just like that. Noon rolled around, and the people rolled on out. It was like a ghost town; I could hear the whistling wind, the tumbleweed and the crickets. The scarves hung limply, like wilted flowers on their stems. The Feel Better Bags just sorta vegged on the table. The lady directly across from me (who was selling infinity scarves), gave up around 1:30 or 2:00. A straggler would come through occasionally, trying to find their way out of this massive, maze-like structure, with their head down and feet moving quickly. I felt like a vendor at a kiosk in the mall, like I was some kind of predator in their world. Didn’t these people know what they came here for? I hate to admit a craft show fail, but that’s exactly what this felt like. There was a vendor at either end of the building selling a variation of my Feel Better Bags. In other words, by the time a customer got to me, they had either A) already purchased one or B) already walked right by two other opportunities for one. Of course, no one else had heat therapy neck wraps like mine, but didn’t seem to help my case. As I may have mentioned, I was directly across from a booth of nothing but infinity scarves. Of course, I think I have the best infinity scarves, but I worked hard on them, so I’m partial. I sold some magnets, but not near what I’d hoped to. I was feeling kind of lowly, when some other vendors started coming up and talking about how bad it had been for them, as well. I wasn’t the only one who experienced a craft show fail. I worried that my stuff wasn’t good enough, but I stopped and talked to a few others who had really great stuff, and they were all disappointed. We hung in there like a hair in a biscuit. At 4:00, we packed it all back up and, in three trips, hauled it all back out to the MinivanWithAPlan…this time without the aid of young, energetic teenagers. I counted my earnings, and excluding the $25 heat therapy neck wrap I donated to their silent auction, I cleared $9 over my vendor fee. That’s right folks, I flopped. Craft. Show. Fail. Me with my partner, Pooh. BUT…I had an amazing time hanging out with my daughter and my sister. I snobbed my way through the entire maze (at least three times), and got lots of neat ideas for future projects. I got to eat an Arby’s roast beef sandwich, because Jimmie went to get us one. I also got to eat a cake pop, because I bought some from another vendor. Not only that, but Pooh, who has never been one for loveys, found herself a lovey at this show…meet Murph! She did not put this dude down for 70 miles coming home, and hasn’t much since then, either. And the best thing about this whole experience is, I have loaded my Etsy shop (AHairInMyBiscuit) with tons of great stuff, just in time for the Christmas shopping season. See? There is a silver lining to my craft show fail! Plus, I got to spend an entire day on Monday after the show with Madre taking pictures for my shop. She is a fantastic model, but no spoilers! You’ll have to click on one of the two provided links to my shop to see the pictures of her piercing, blue eyes. I hope you’ll check out my shop! Business has already started picking up on Etsy, and I’m thankful. If nothing else, the show motivated me to do a lot of work in a short amount of time. Now I can focus on the busy holiday season at the salon, rest and relax on the weekends a little bit (yeah, right! ), and look forward to all that the future holds with my beautiful family. I’m always thankful for a lesson learned, and time well-spent…every minute of it! He’s named after my cat, isn’t he? 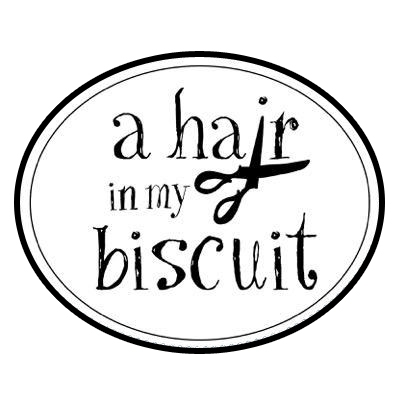 Four Months In Review | Is That A Hair In My Biscuit? Life Is A Whirlwind | Is That A Hair In My Biscuit?